Introverts and Shy, What's the Difference? 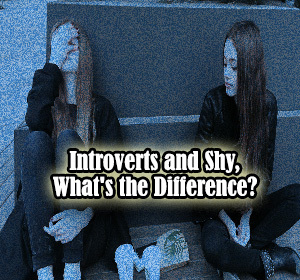 - Ex of Introvert Introverts and Shy, What's the Difference? Introverts and Shy, What's the Difference? Introverts and Shy, What's the Difference? - Many people misinterpret that a shy person actually is an introvert. Actually no. They are two different personalities. If we see someone who is more preoccupied with his book, we tend to think nerds are a shy person. Whereas a bookworm, usually are an introvert, you know? And what a difference an introvert with a shy person? People extroverts also a lot that can not be overcome stage fright and a sense of nervous when dealing with others. Not that when a person becomes a shame he is an introvert, and vice versa. Shyness is fear of negative judgment from others. While the introvert is a person's choice to remain calm. An introvert also prefer to choose a quiet place even though they are actually able to overcome the judgment of others to themselves. An introvert prefers not to mingle, but they were able to do so. Introvert does not mean antisocial. They do not mind to join with others or within a community. In contrast to the shy person, for him to live in a social world is something that hurts because they do not know what they should do and are too afraid to get negative ratings from others. Often we make the label, so that over time the introvert can be a shy person, and vice versa. This is to be realized by our society in order not to make the wrong people recognize himself. An introvert would often feel frustrated when others treat them as though they were as shy. Introverts do not want to be misunderstood. Although indeed, the nature of these people prefer to spend their days with passive. Now you would have been able to distinguish between a shy introvert, right? So, which one are you? Home » Introvert » Psychology » Social » » Introverts and Shy, What's the Difference?